The nautical chart – that simple and so very complex map that enables safe navigation over millions of miles of coastal waters – is undergoing a revolution. For two hundred years, NOAA’s Office of Coast Survey has gathered ocean measurements and created the Nation’s nautical charts – on paper. NOAA pioneered digital charts in the 1990s, and demand has grown steadily since then. This year, NOAA decided to shift the focus of chart production to digital products, while still supporting an important (but declining) demand for paper. Using digital technology, cartographers can now use more data at a higher spatial resolution and richer attribution than was possible on paper nautical charts, giving the maritime industry greater navigational intelligence to manage risks. 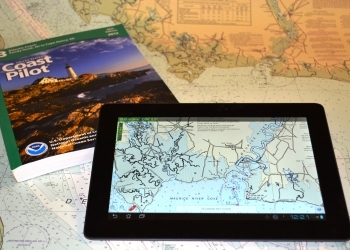 Last year, Coast Survey beta tested MyNOAACharts, an app for Android tablets that allowed users to download NOAA nautical charts. Users could find their positions on updated charts; they could zoom in on any location, or zoom out for the big picture to plan a day of sailing. Hundreds of users commented during the beta test, providing essential insights, and Coast Survey listened. One key project insight was that Coast Survey’s distribution formats for nautical charts are not well suited to mobile apps. 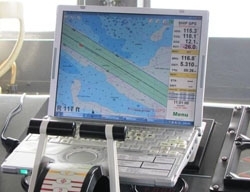 Coast Survey also recognized that there is an innovative and growing commercial market for mobile navigation apps. With input from the user community in mind, Coast Survey decided to cancel further development of the app and instead refocused efforts on improving the distribution system for charts and other navigation data. This summer, for instance, Coast Survey will make it easier for app developers to use NOAA charts in their products by breaking charts into much smaller “tiles,” which are used widely in mobile apps, web maps, and commercial chart plotters. This will empower the next generation of app developers, chart redistributors and software entrepreneurs to create new navigation products, and speed updated chart information to U.S. boaters.